Reach our Office of Philanthropy at 860-358-6200 or donate@midhosp.org. 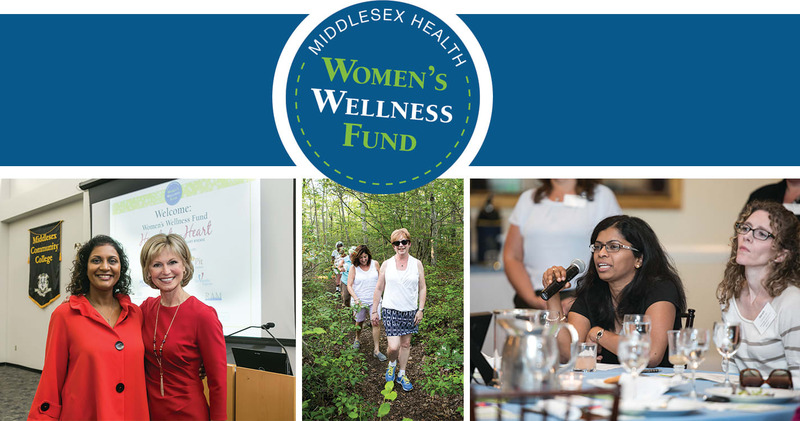 The Women’s Wellness Fund at Middlesex Health advocates for, educates about, and funds priority health projects in our community. When you become a member, you are invited to three fun, interactive, informative health talks each year. Your membership spans a full year from the time you join. 100% of your donation will be used for the priority project of your choice - and your donation is fully tax deductible. If you would like to make a donation or become a member by mail, click here to download a pledge form. Times and locations will be announced closer to the events - contact us or check back soon! These events are open to Women's Wellness Fund members and their guests. For information, please contact Sarah Moore, Director of Development, at 860-358-8704 or sarah.moore@midhosp.org. Meet the members of our steering committee and read about our priority projects in 2017, 2018, and 2019. Create and renovate Wig Rooms at Middlesex Health Cancer Center in Middletown and Westbrook that are inviting and peaceful to support women experiencing hair loss as a result of cancer treatment. Partner with Middlesex County NAACP on a Health Equity Study to identify health disparities affecting diverse communities and women of color. Support the Perinatal Social Work Program, which connects pregnant women facing extreme circumstances with community resources to find better housing, access cash assistance and food benefits and receive mental health counseling, among other supports. Deep Inspiration Breath Hold (DIBH) is a radiation therapy to treat tumors in the left breast. It works by measuring a tumor’s microscopic, internal movements as a patient inhales and exhales, focusing the radiation dose on cancerous tumors and reducing exposure to the heart. It will be available at the Middlesex Hospital Cancer Center in Middletown and Westbrook. Heart disease is the leading cause of death for women in the United States. A new program called “Heart Connect Calls,” designed by the Middlesex Hospital Center for Chronic Care Management, leverages the power of technology to help people with heart disease improve their quality of life. Through a series of automated calls, and live support from a Hospital clinician, people are given the tools and resources to better manage their disease all from the comfort of their own homes. Imagine that you are pregnant with your first child and are also homeless, have an abusive partner, or that you experience mental health issues. Who can you turn to for support? The answer: the Perinatal Social Work Program. A licensed clinical social worker at Middlesex Hospital’s Pregnancy & Birth Center and Maternal Child Health Program connects pregnant women facing extreme circumstances with community resources so that they can find better housing, access cash assistance and food benefits and receive mental health counseling, among other supports. We hosted four free talks about new tools to detect breast cancer including Molecular Breast Imaging (MBI) and 3D Mammography. We helped more women gain access to 3D mammography, which has been shown to detect 40% more invasive cancers, by replacing the Hospital’s 2D mammogram machines with 3D machines. The Hospital now has seven total 3D mammography machines, which are located at the Outpatient Center in Middletown, the Shoreline Medical Center in Westbrook and the Marlborough Medical Center. We helped pregnant women have more freedom to walk around during labor by installing a wireless fetal monitoring system in the Pregnancy and Birth Center, which helps moms deliver and recover more quickly and helps to lower risks for babies and moms. We helped pregnant women who need medical, mental health, or financial support by supporting the Perinatal Social Work Program, working to ensure that moms and children are healthy and safe.